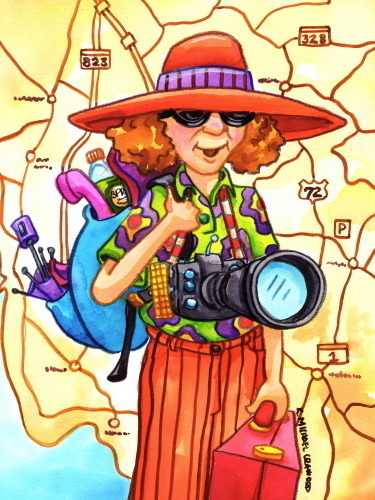 Any good tourist knows what goes in their backpack or satchel is the most important element to enjoying that fun-filled vacation. You never know what you will stumble upon, so you want to be prepared for the unexpected, or in my case most of the time, the unexplained. The first thing to go into my pack is food and water. Although, I always wind up eating at some delightful and fun places, I like to be prepared in case I become stuck on some back road or an airport runway for ten hours. As you may know, it is illegal to depart a waiting plane to hit McDee’s, even if you’re the flight attendant. Next, I throw my sketchbook and pencils into the backpack so that I am prepared to draw funny pictures of the people sitting around me– in case my travel plans surround me with the best characters I have ever seen. Then, I throw in a few paper towels in case of spills or “sleeping slobber” from the tourist next to me. A ten-gallon container of hand-sanitizer for those Johnny’s on the spots or I-haven’t-been-cleaned-since-the-Nixon-Administration gas stations. I also include a box of tissues, a cell phone with 52 apps, video games, a book, band-aids, everything from my medicine cabinet and a partridge in a pear tree. The last thing I do is I make sure I haven’t missed anything. I don’t know why they put a restriction on how much you can carry on a plane nowadays. Don’t they know you will need all that stuff, especially if you crash on an island like the cast of “Lost”? I’m packed and all ready to head out the door for a vacation in my own town. Yes, you hear me correctly. I am going to be a “touri” (what I call a tourist) in my own town for the day. You can’t imagine all the wonderful things there are to see within a 30-minute radius of your own front door. I can hear you now, “Well that’s easy for you to say. There are lots of things to see and do where you live.” I believe that wherever you live there are tons of things to see, even if it’s just revisiting the nature in your own backyard. If you haven’t trimmed the grass in a while, then there is going to be a lot more nature to see. One of my favorite places to visit on a one-day vacation is hysterical (better know to you as historical) Ellicott City, Maryland. The city has quite a shady past and dates back to 1772 when John, Andrew and Joseph Ellicott founded the mill town. So the town has lots of whimsical characters roaming the streets, some of them living and some not. I have to admit what I like most about the town is its seedy past and ghost stories. For example, a few years ago, a restaurant owner mysteriously disappeared and was never seen again. My imagination goes into overload with that bit of information– he took up with pirates and is now raiding cruise ships for their delicious pastries and margarita bars. Can you think of a better way to keep your imagination active when you visit somewhere familiar and look for new things in a place that’s as old as the hills? Ellicott City is also a place that changes on a daily basis, whether it’s a mysterious person building cairns in the river or a new shop opening up. It’s a place that reminds me to always look at life as if I am seeing it for the first time and that’s important for the author/artist side of me. Never mind the fact that it’s the only place in the area I can get Chocolate Baby Candies. So, I will keep taking my mini-vacations or holidays, just to see where they will take my imagination and me. I am thankful there is no need for me to put my tray table and seat in their upright positions, for I am always ready for “take off” in my own town. K. Michael Crawford is the creator and mastermind behind the first-of-their-kind adventure drawing books, The Mystery of Journeys Crowne, The Island of Zadu and Batty Malgoony’s Mystic Carnivale. K. Michael has illustrated over thirty books and won a number of awards in the magical journey of Children’s Books. To learn more, visit www.happilyeverart.com. Happy Adventures!